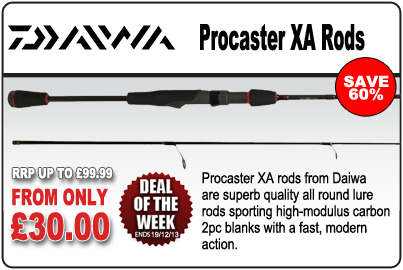 Deal of the Week - Daiwa Procaster XA Spinning Rods - RRP up to £99.99, Now from only £30.00! Daiwa Procaster XA Spinning Rods are exclusive to Glasgow Angling Centre in the UK and feature a range that is suitable to cover any situation. The ultralight 5ft6 model is ideal for spinning with small Mepps and lures for Trout or Perch. In contrast, the heavy duty 8ft model can easily throw a whopping 30-90g (bring on the big lures). With Fuji reel seat, foam handle and lined Fuji guides, you are getting a stunning rod for you money, so don't miss out on this fantastic offer and SAVE 60% while stocks last! !